Rev. Jolly Nyame, former Taraba governor, on Tuesday, joined his excited colleagues to celebrate stylish Christmas haircuts offered to 300 inmates of Kuje Prison, FCT. The News Agency of Nigeria (NAN), reports that the free haircut was offered by the National Association of Barbers and Salon Employers of Nigeria (NABSEN), during a Christmas visit to the Prison. The outreach was undertaken in collaboration with Fades and Bangs Global, an Abuja-based international barbing outfit, and Maria Luna, the Deputy Ambassador of Venezuela. A NAN correspondent, who covered the outreach, reports that the inmates also received blankets, beverages, among other items. Nyame, who did not require a haircut at the time, watched with excitement as his colleagues danced to the deafening music after the haircuts and carvings that saw some spotting hairstyles like “punk’’, “Afro’’, “Steve Wonder’’ and “curls’’. The former Taraba governor, who is serving a 14-year jail term, lauded NABSEN for the kindness, describing it as “touching’’. “They (prison inmates), are very happy; they are looking so beautiful and radiant on Christmas day,’’ Nyame told NAN. He said that the NABSEN initiative was “very excellent’’, adding that his colleagues would “always remember this show of concern’’. “There is a rush for the service. Everyone wants to come out for the haircut. It is difficult to control them. There is a rumble inside the yard. I have never seen the inmates this happy since I came here,’’ he said. Earlier, Mr Musa Mantu, Chairman, Board of Trustees (BOT), of NABSEN, had told Mr Innocent Onoja, Controller of the prison, that the gesture was to “make the inmates look and feel good on Christmas day’’. “We want the inmates to know that we remember them and care for them. “We also want to encourage them and let them understand that being in prison is not the end of life; we want them to feel positive and be inspired by the prison experience to succeed in life after serving out their terms,’’ he said. Mantu, son of former Deputy Senate President Nasir Mantu, promised that NABSEN would make the visit an annual event and strive to get more items toward a better life for the prison inmates. Onoja, in response, thanked NABSEN for the gesture which he described as “very encouraging and good for the season’’. “I am particularly appreciative of the blankets because of the cold weather; we need to keep the inmates warm and in good condition and spirit,’’ he said. Onoja said that the facility sometimes faces difficulties in providing enough mattresses, mats, toiletries, disinfectants and blankets, and shall be happy if there was some support from outside. Speaking to NAN, Mr Chibueze Awuzie, National Deputy President of NABSEN, said that the outreach was to give a sense of belonging to the inmates, adding that the free haircut was to “make them look beautiful at Christmas’’. Awuzie advised the inmates not to feel abandoned by the outside society and promised to make the outreach more regular so as to reach the inmates through the barbing profession. He challenged Nigerians to show love to those in prison, saying that such affection would give them hope and encourage them to understand that their current situation was just a passing phase. The barber said that the association had 10 million members and was the leading Micro, Small and Medium Enterprise (MSME), with the highest number of employees and branches in the country. Luna, the Venezuelan envoy, who also spoke with NAN, said that the Embassy offered to procure blankets for the prison inmates as part of efforts to assist the vulnerable members of the society. She commended the prison authorities for keeping the facility “very neat and habitable’’, and expressed the readiness to work with organisations committed to helping the poor. Luna said that she had equally visited many rural communities in Osun, Ondo, Owerri, Ibadan, Lagos and Ekiti and donated food, toiletries, school kits and medicines for malaria and typhoid. The “Provost-General’’ of the prison inmates, who gave his name as “Bekke’’, said that the barbers had “made our Christmas’’ by the visit. “This is the first time we are getting this quality haircut here. It is a good innovation. For a corporate organisation to offer this service free is very laudable. It is fun and very encouraging. “Some corporate organisations come with food and other materials, but this is a different and wonderful dimension. We want other organisations to emulate such kindness,’’ he said. 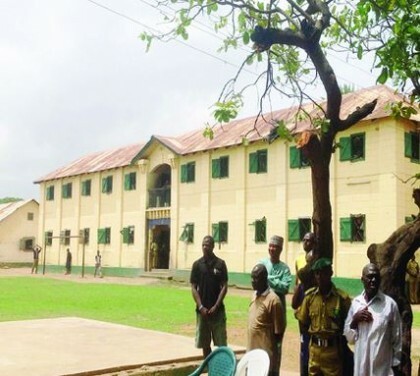 The “Deputy Provost-General’’ of the prison inmates, Abdullahi Mohammed, also thanked the visitors for the gesture, saying that his colleagues were “very excited’’ to have the free haircut. “There are people that have been here for more than 15 years and cannot remember when last they had a smooth haircut. There is no doubt that this experience will be in their memories for a very long time,’’ he said. Mohammed, from Nasarawa State, thanked NABSEN for the kindness and “for remembering prisoners’’, saying that he had never had such a smooth haircut “in several years’’. Another prison inmate, Mohammed Murtala, who had been in the prison for 14 years, described the barbing experience as “very smooth’’, and prayed God to bless NABSEN for the gesture.